Are you trying to find an AA, NA, or OA meeting near you? If so, read on because it’s our aim to help you answer this common thought for you with what comes next. Alcoholics Anonymous: go to aa.org and select your region. Ask your recovery counsellor, therapist or sober coach: Professionals who have already worked with you are aware of your unique situation and can recommend meetings whose ‘flavour’ will suit your tastes. Ask peers for recommendations. Chances are that the people you got sober with in treatment, have some experience as to what meetings they liked and would recommend to newcomers. Obtain a full meeting list at a meeting. Often the meeting list itself gives clues to what you can expect at the meeting, such as ‘closed step discussion’ or ‘speaker meeting’. Speaker meetings are a great way to get introduced to AA as they involve one or more speakers telling their personal stories at length; it’s a chance to listen, identify, and not worry about participating if you don’t want to. Call the hotline. Toronto’s number is (416) 487-5591 and you can speak to a person who understands what you’re going through, and who can not only give you factual meeting information, but a mini-introduction to AA that answers your questions right there on the phone. Finding AA meetings near you is a breeze. Recovering alcoholics are so willing to help, they may even come to you in the form of a 12-step call or an in-house meeting at your detox or treatment centre, because it helps them – as much or more as it helps you. So, find an AA meeting near you today – and meet new friends, learn new tools, and get the ongoing support you need to reach your recovery goals. Wondering if you have a drinking problem and whether or not you need help? Do I Have a Drinking Problem and Do I Need Help? If alcohol has started taking on greater importance in your life than it should – whether you’re thinking about a drink for most of the workday, suffering from a hangover far more often than you would like, or care more about alcohol than you value the things that once mattered to you – it’s time to think about reaching out for help. At Renascent, we have a passion for helping people recover from alcohol and drug addictions so they can reach their full potential – with compassion, respect, empathy and understanding. And we understand that even after treatment is complete, alcoholism doesn’t just vanish as if it had never been there in the first place. For all these reasons, and many more, we recommend attendance at 12-step meetings like Alcoholics Anonymous. Quite simply, it’s aftercare for as long as you need it, even for a lifetime. If you are hesitant to attending AA meetings, your resistance isn’t isolated and you’re not alone. Others that were once in your shoes, set their objections aside, gave AA an Honest, Willing and Open-Minded attempt and are now leading lives that would otherwise be unavailable to them. 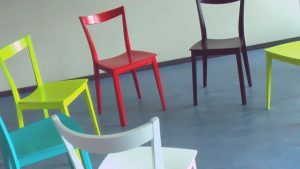 It may seem surprising, but there is resistance to attending AA meetings even among people who have lost virtually everything to their addictions. For a person who is sleeping outside and barely staying one step ahead of the law, it might seem as though sitting in an AA meeting can’t possibly be that bad; but people who have never tried AA, or have heard discouraging things about meetings, or have had some negative experiences in the past, may be reluctant to give AA a try. I have already tried meetings, but they don’t work. Let’s look at these objections in greater depth because, while many AA members would simply dismiss them out of personal experience, that is not necessarily helpful to a person who has their doubts. We have heard of 12-step members who hold the philosophy “Well, when you’re desperate enough, you’ll go to a meeting” but we feel it is important to address people’s legitimate concerns so that newly recovering addicts and alcoholics can make a more informed decision about attending AA meetings, rather than waiting until their situation is dire out of prejudice or lack of information. While millions have gone to AA and found relief from the relentless grip of alcoholism, there are those who maintain that it comes at a price: that AA is a cult which demands compliance from its members and shuns those who are non-believers. Of course, any worldwide movement of people who follow a specific ‘program’ or way of life such as the 12 steps of recovery, can seem suspiciously cult-like: there’s the special jargon, the super-cheerful members, the closed meetings, the chanting…yet none of those activities have the actual characteristics of a cult, any more than a private clubhouse with a secret handshake is a cult. While devotees of the 12 steps do believe strongly in the steps as a program of recovery, AA’s basic text, the Big Book of Alcoholics Anonymous, itself maintains that its steps are only suggestions and that the organization has no monopoly on recovery. Another characteristic of cults is the entitlement of its leaders, who often have complete power over the members and force them to do things they wouldn’t otherwise dream of doing. But AA, with its inverted pyramid structure, is the epitome of ‘by the people, for the people’. As per AA’s Tradition Two, its leaders are but trusted servants, and do not govern the membership, nor do they seek personal fame or wealth. In fact, the tradition of anonymity practically guarantees that the organization’s trusted servants remain all but invisible. Indeed, most of AA’s Twelve Traditions are preoccupied with making sure that the organization never attains cult status. Tradition Seven ensures a group may not become wealthy; there is an injunction against the pursuit of money, property and prestige; Tradition Eleven forbids actively recruiting new members; and Tradition Five makes sure that the group stays on purpose – helping fellow alcoholics – rather than pursuing any other ideals. These traditions ensure the fellowship remains healthy and unified. Because the word ‘God’ is used in many of AA’s texts, word outside AA has it that you have to believe in God to join AA. However, if this were the case, AA certainly would not have grown to the strength of a worldwide movement, because even aside from all the alcoholic agnostics and atheists who wouldn’t have wanted to join, even religious people would be skeptical; after all, believing in God hadn’t helped with their alcoholism, so why would joining a new religion change the game? AA is a spiritual program, not a religious organization. It has only one requirement for membership: a desire to stop drinking. Members who participate in the 12-step recovery process are invited to find a power greater than themselves, which some choose to call God, and others don’t. Of course, some groups may emphasize the ‘God idea’ more than others. That’s why it’s important, when finding an AA meeting, to look for those that you feel might be a good fit for you – and to try more than one meeting/group, lest you write off a huge support fellowship of recovering addicts and alcoholics because of the religious beliefs of a small percentage of its members. You Just Got Sober. Why Be Reminded of the Problem? Often people are reluctant to attend meetings because the last thing they want to think about, talk about or be reminded of, is the drinking/using game. They’re afraid that hearing about other people’s experiences with drugs and alcohol will just make them want to use again. While thinking too much about drinking can indeed bring on a dangerous state of euphoric recall, the fact is that at most 12-step meetings, members don’t languish in the problem of addiction or telling ‘war stories’ about drinking escapades; they are focused on the solution, and what they are doing today to stay sober. It’s an important distinction, and leads to the question: would you rather sit at home (or wistfully walk past watering holes) and obsess about the ‘good old days’, or would you rather be at a friendly gathering of understanding people who used to love to drink as much as you do, but who have also had their lives torn apart by addiction, and are focused on getting better? If you do feel triggered during a meeting, you are in a safe space with people who have been there, and can help you get through it; it’s really the only place where being triggered has a lower chance of ending with relapse. Oddly enough, once most people go to a few meetings, they find themselves socializing with the other ex-problem drinkers and drug addicts in the room, quite naturally. Far from feeling triggered in the presence of other alcoholics and addicts, they actually seek such people out as new friends who will form an important part of their support network during treatment, after-care and beyond. While many alcoholics end up socializing with a mix of fellow AAs as well as with their non-alcoholic friends, colleagues and family members, some people find such solace in the fellowship that it becomes like a supportive family without which they would actually feel more vulnerable to drinking, not less. Many people have had some exposure to AA meetings before they made a serious attempt at recovery – and not all of them have had good experiences. Everyone has a story to tell about sitting in meeting after meeting to no avail; meeting a sponsor who was too controlling, or wasn’t ever available; or even getting snubbed by cliques. Like any organization, AA has members who aren’t perfect and who don’t follow AA’s suggestions; AA doesn’t support or endorse their behaviour at all. It happens, but does it mean that the AA program itself is a write-off? One question to ask would be, ‘What have I put into my recovery in AA?’ That is, have you followed the suggestions, tried different meetings, reached out to others for help and advice, shared your story, looked for a sponsor, started reading the literature, and made your best attempt to stay sober? Have you put your heart and soul into AA and really tried to work the program? Or have you grudgingly sat in a chair and looked at your phone, waiting for the meeting to be over? In truth, even enthusiastic meeting attendance may not be enough to keep you sober. This doesn’t mean that AA doesn’t work, but rather that AA is comprised of far more than meetings alone. The real magic of AA lies in making connections with other like-minded individuals who can share their experience, strength and hope with you to help you maintain contented sobriety. It’s about learning and practicing a new way of reacting to life that, along with outside supports and skills, will give you the tools to meet sober life head-on, with joy and serenity. There’s a reason why addiction doctors, therapists, detox centres, treatment centres and all manner of mental health professionals recommend AA: It has been proven to work. Hopefully we have helped shed light on some of the issues you may be concerned about, and we also encourage you to do your own research and have your own experience around giving AA meetings a try. Hi there, I am just looking for a group (women only) near me – West Auckland or central would be great.